Over the years, while running mandala workshops many people have asked about resources to continue learning and engaging with mandalas. Mandala colouring books are readily available and there are a few books that provide information about mandalas in general. I saw the possibility of producing a workbook that would guide people in creating their own mandalas, whilst learning more about their use in a variety of traditions and disciplines. 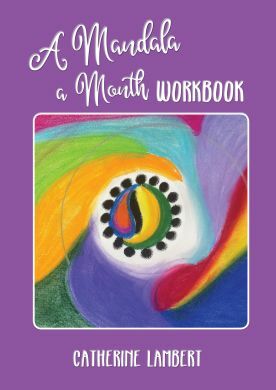 A number of months ago, I began compiling the resources I had developed for Mandala a Month in 2013 and adding to them. I took the time to create a fineline mandala for each theme. I took the plunge in submitting this material to be considered for publication. I was absolutely staggered when I was informed that they would be very interested. Well, I am very happy to say that the book is now available. The workbook contains twelve chapters, one for each month of the year. They do not have to be started at the beginning of the year, but take the participant on a journey through a whole year. Each chapter contains introductory material which outlines one aspect of the use of mandalas, followed by a meditation on the theme. These meditations are also found in the form of an enclosed CD. These meditations are accompanied by the beautiful music of Cath Connelly on the Celtic Harp. There is a space for people to create their own mandala and a fineline mandala for colouring. The workbook emphasises the use of mandalas as a spiritual practice and the format encourages regular use throughout the year. The book is available from Mediacom for $32.75. I will also have copies available at mandala workshops in the future.